These days, our fish houses are out and about all season long. 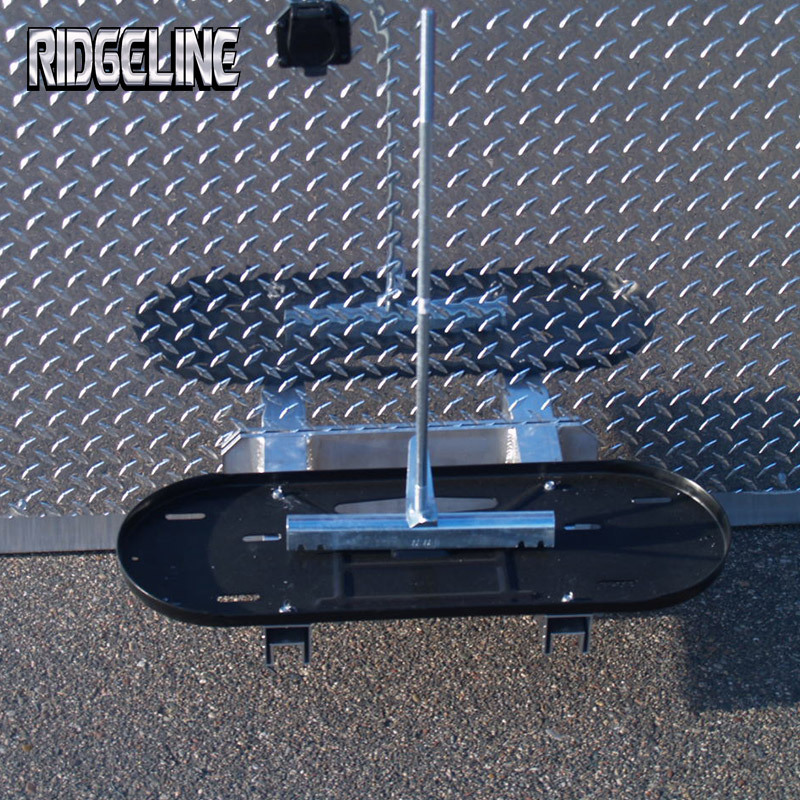 Not only can they haul your atv, utv and other toys, they perform flawlessly on the frozen. 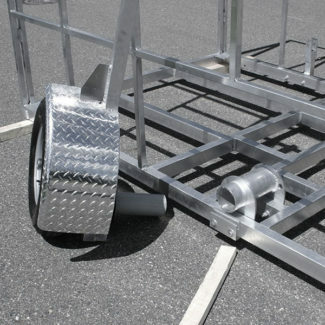 That’s why our wheel houses have become such a popular choice for the true sportsman – ultimate versatility. Along with super light, durable construction and great options for the way you fish. 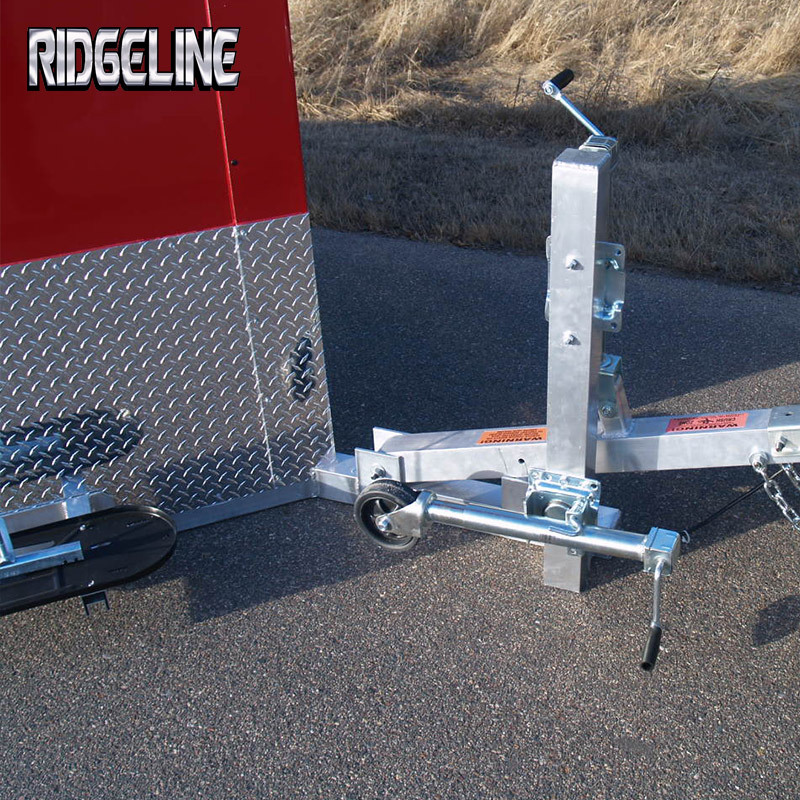 These are all huge benefits extending your fishing season adding to the value of your trailer. 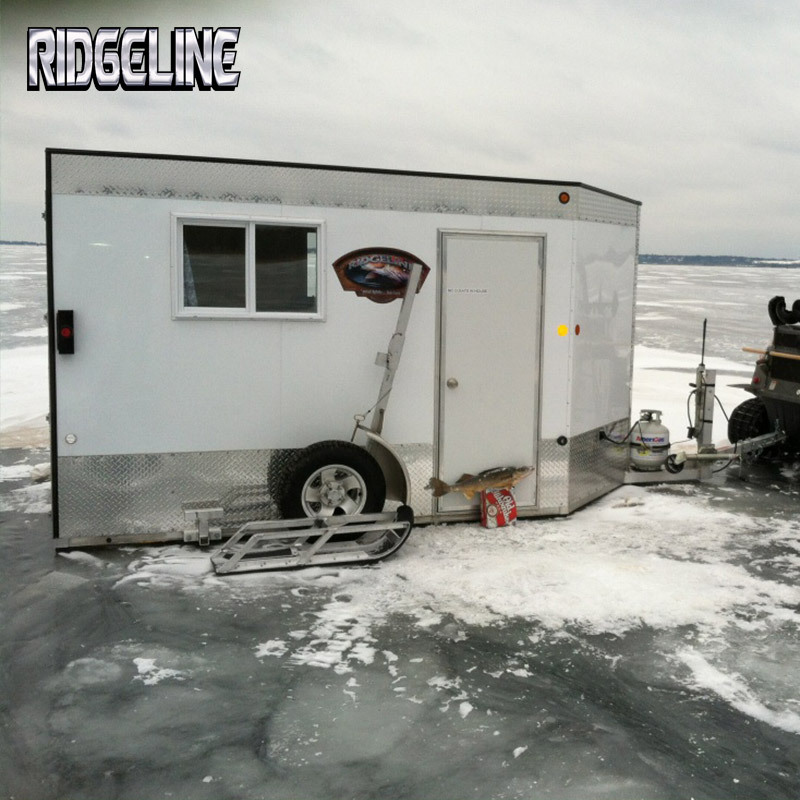 You’ll see our skid houses out there too, getting real fisherman closer to the hot spots. So no matter which option you choose, you’re one giant step closer the next big haul. Tread lightly, fish hard! 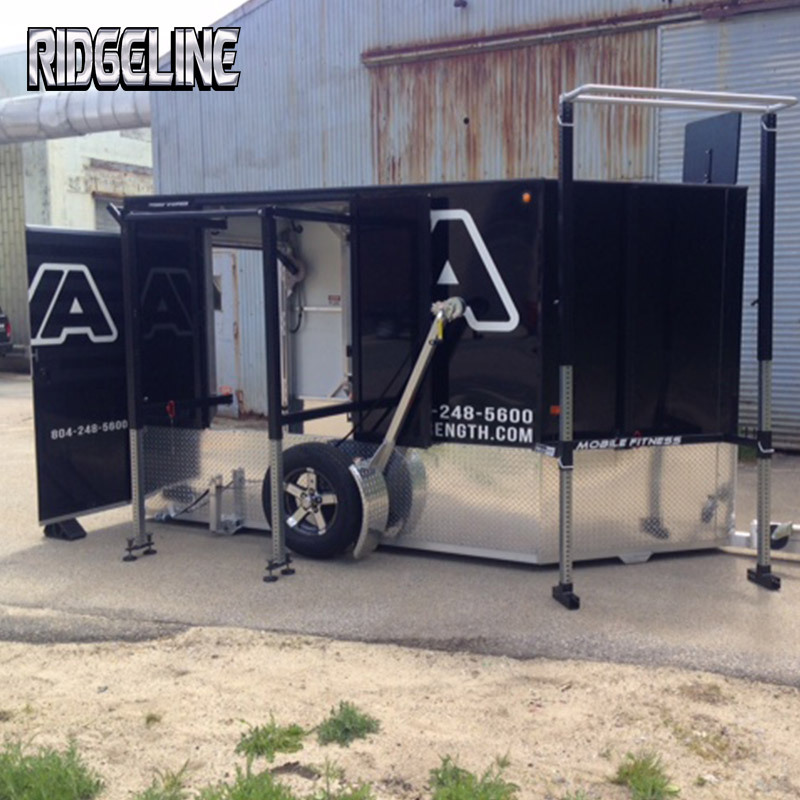 All Aluminum Construction – Built from the ground up, the way you want it! 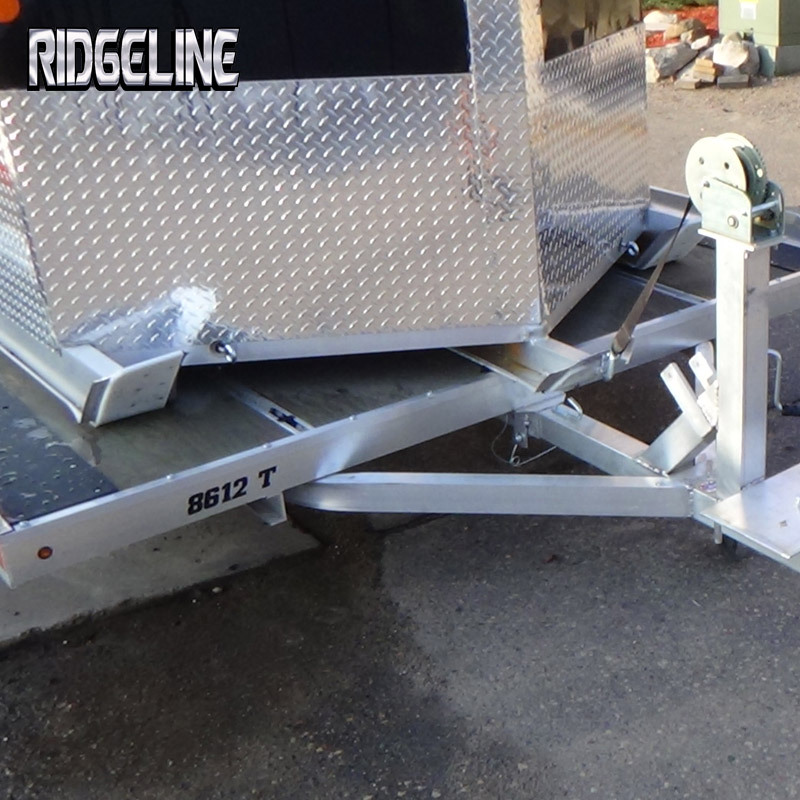 Designed for fast and simple loading and unloading, while being lightweight. 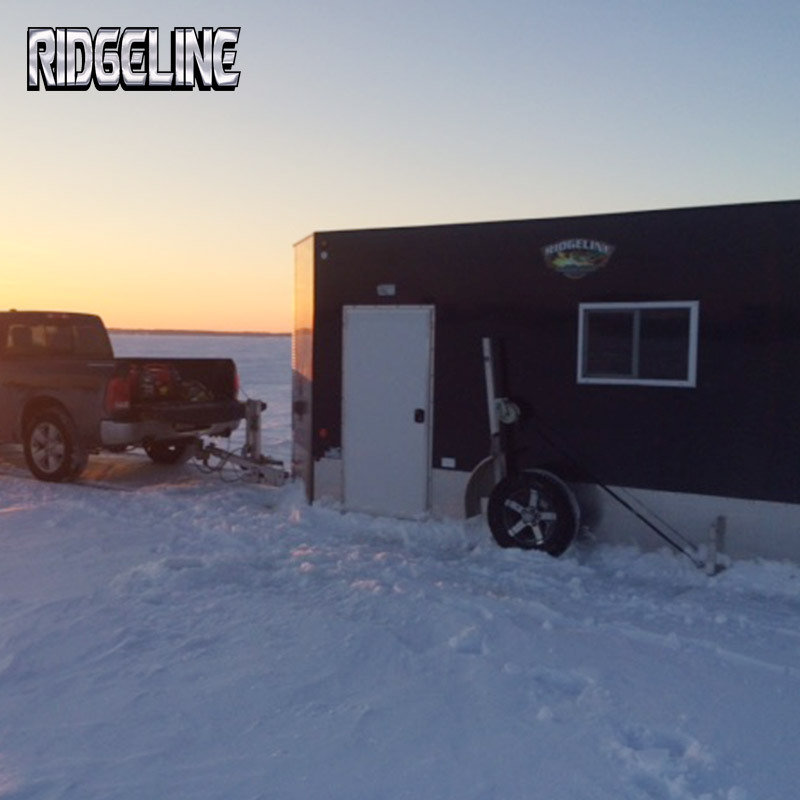 Especially designed to be able to hit early season and late season ice fishing. 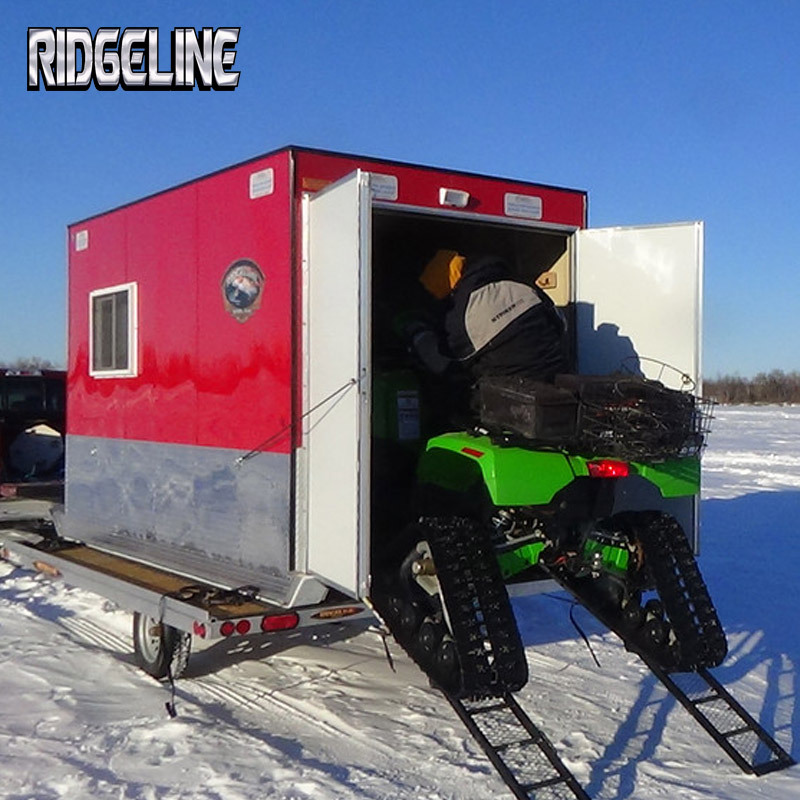 Ridgeline is here to extend your ice fishing season while being able to tow this around easily with just using your ATV or UTV. • All aluminum Frame. 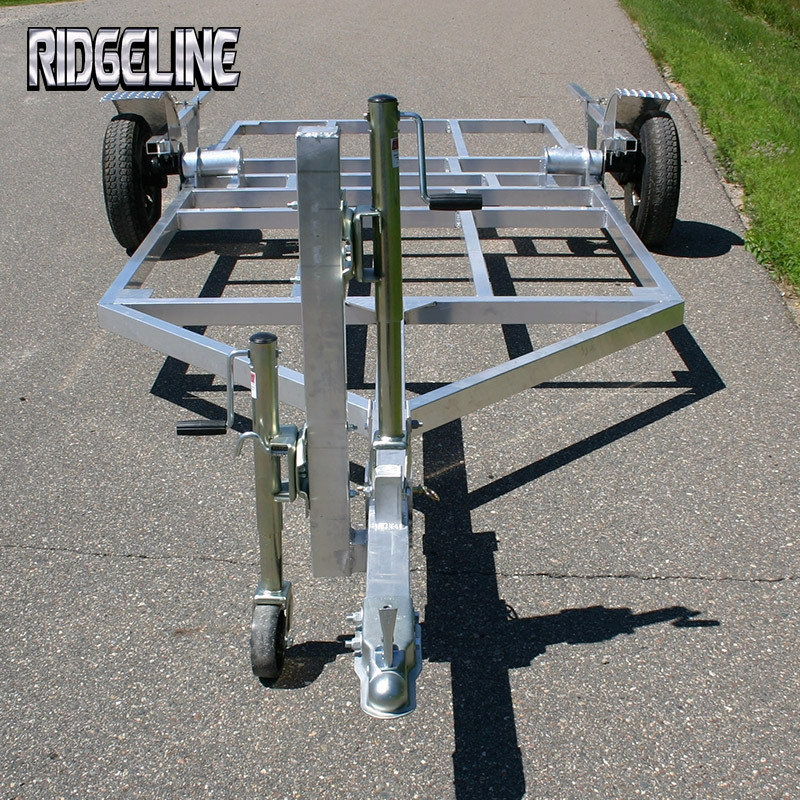 Light Weight Trailers – Tow with ATV or UTV … even push out by hand. • .040 Aluminum Siding. Color choices of Red, Black, or White – with several other colors available for pre-ordered units. 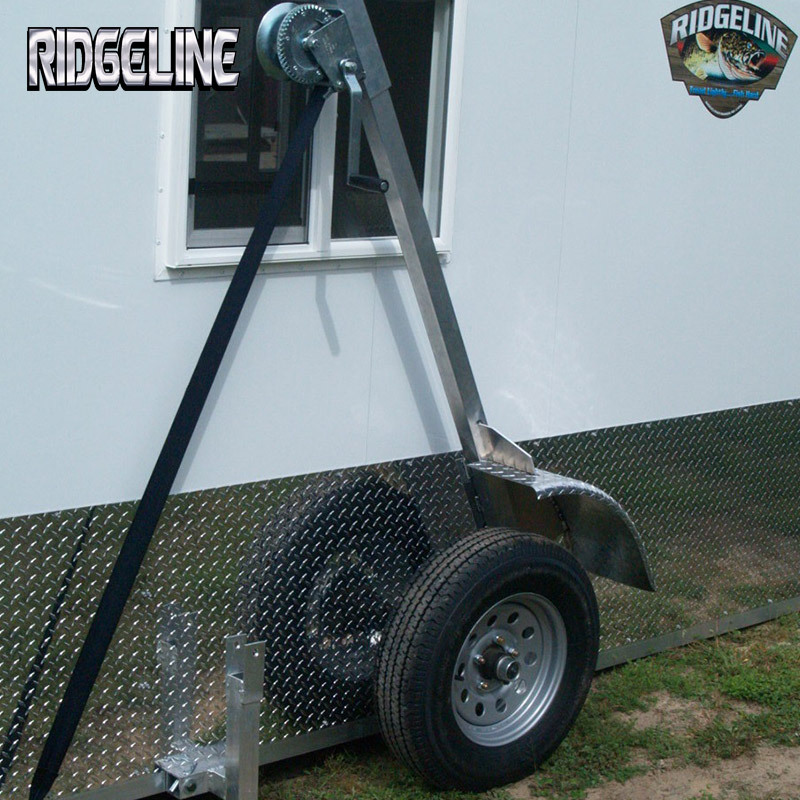 • Removable wheel/axle assembly, with integrated easy lift leverage arm system. 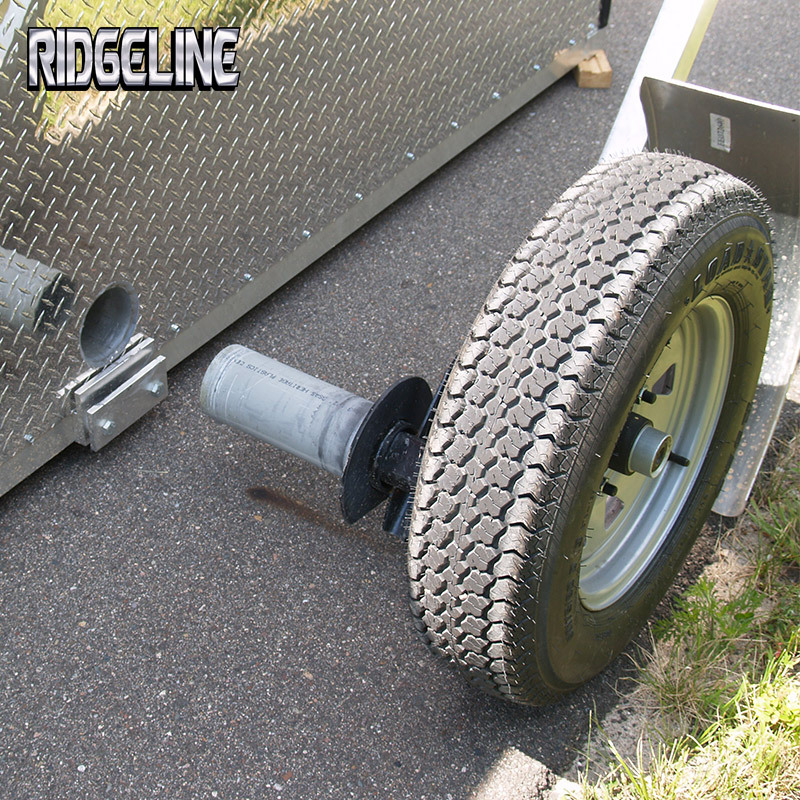 • 13″ steel wheels with C rated radial tire. Upgrade available to aluminum mag. 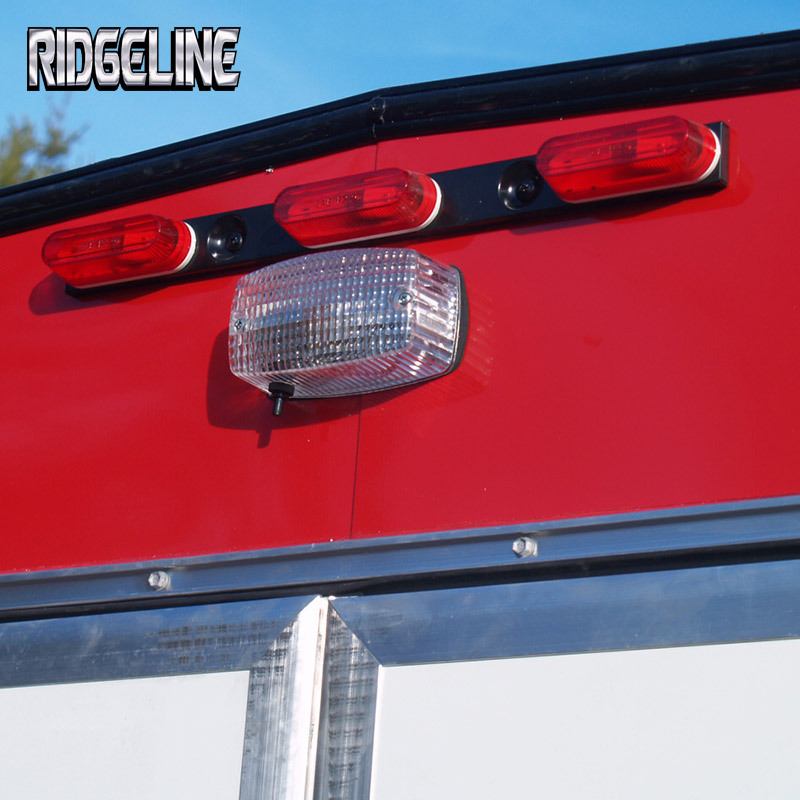 • Trailer Brake lights, Interior lights, and an exterior porch light are standard. 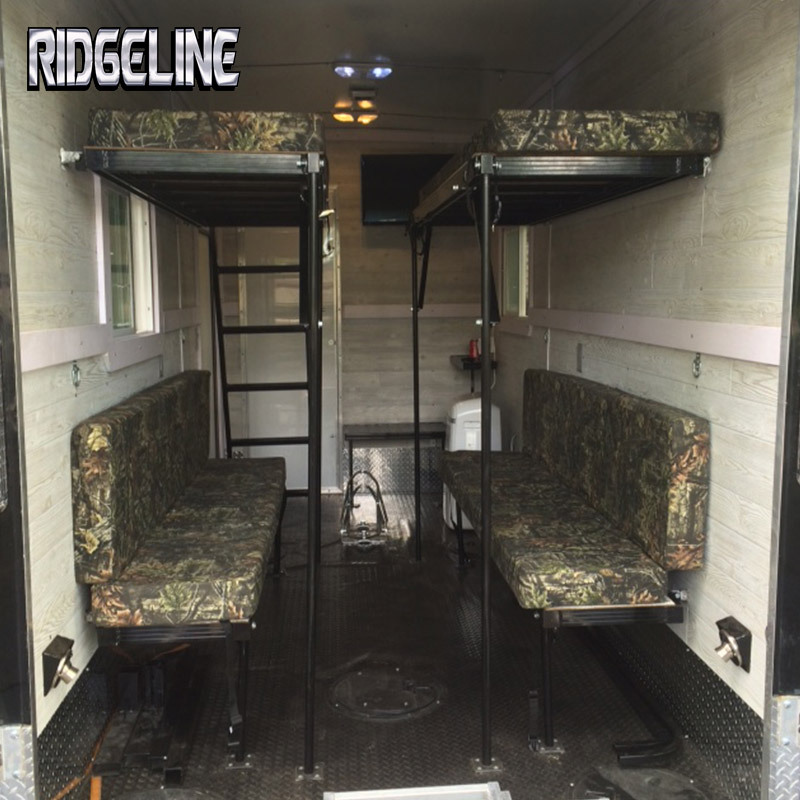 2 Interior in 6’x8′ & 6’x10′, 3 Interior in 6’x12′. • Roof is pitched to shed water and snow quickly. 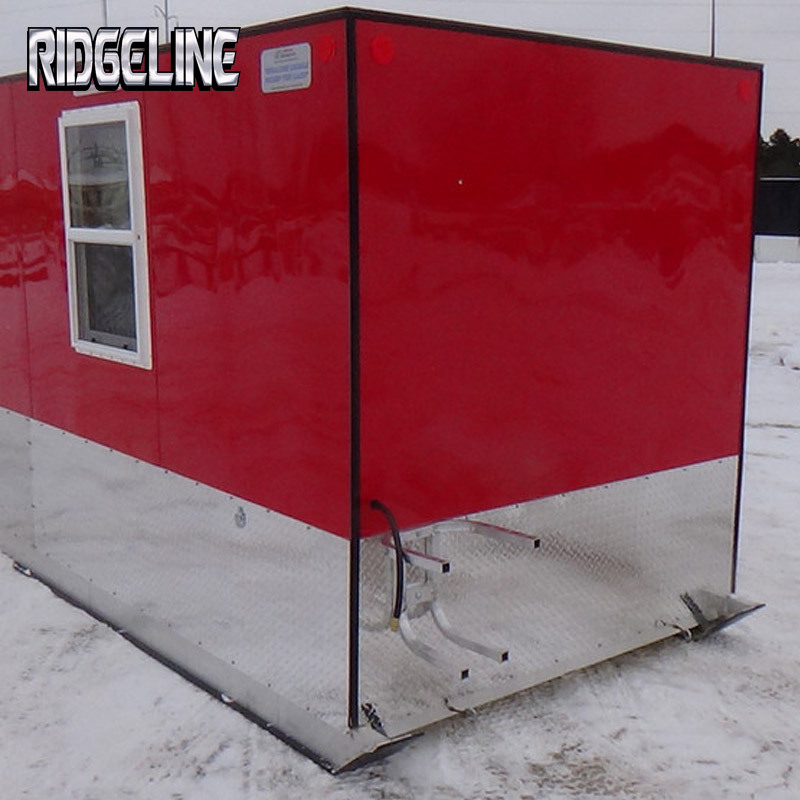 • Rear Double Door from Eagan included Standard – Features a 64″ wide x 71.5″ tall opening. • 4 Catch Cover Brand ice hole covers included loose. • Pass thru hatch for hose or cable. • 6 Interior Tie Down Points. • Two fresh air vents. 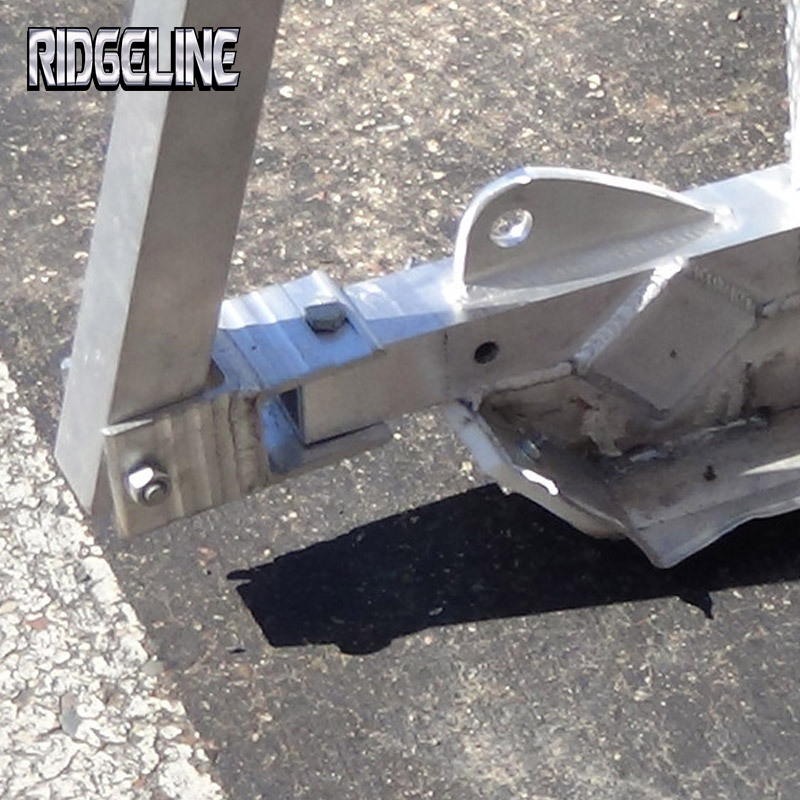 Lightest weight option with lower cost. More aerodynamic when towing on the highway. 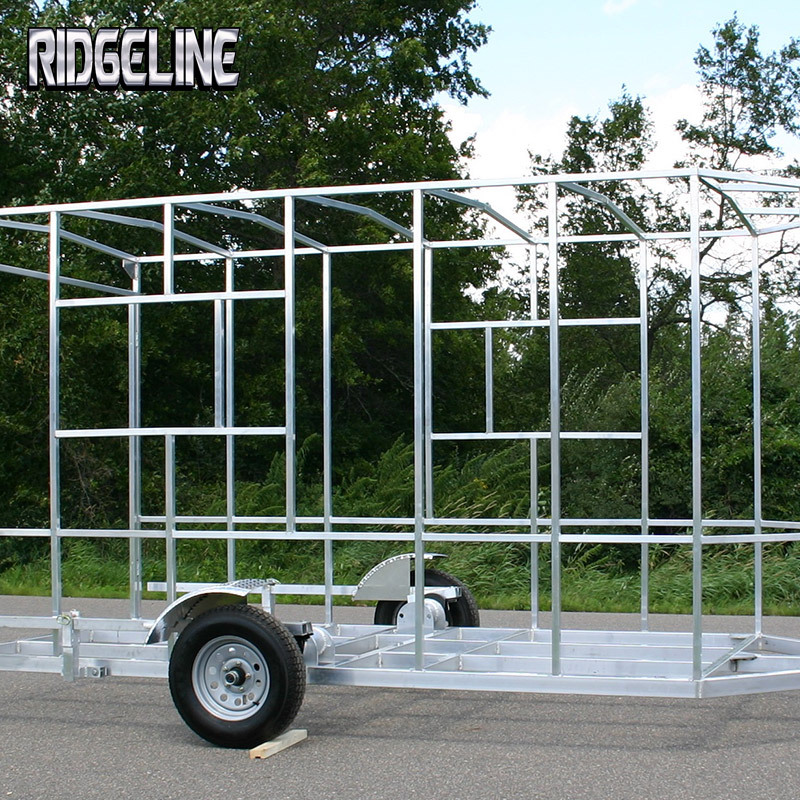 Great for towing with extra interior space ideal for creating storage and additional fishing space. 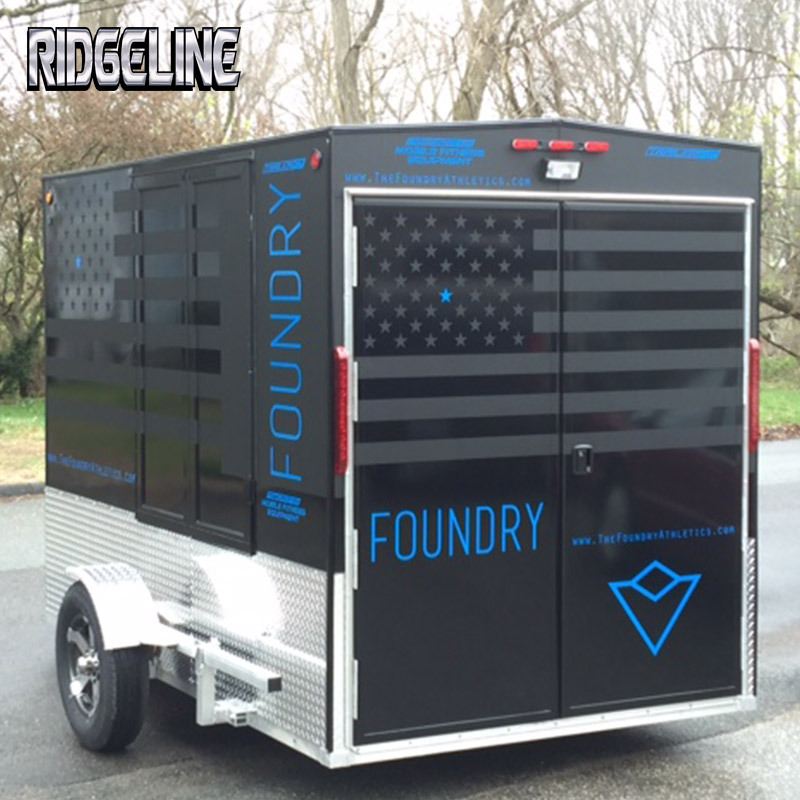 The standard frame has performed awesome for many years, and is the popular choice for people hauling 1700 pounds or less. 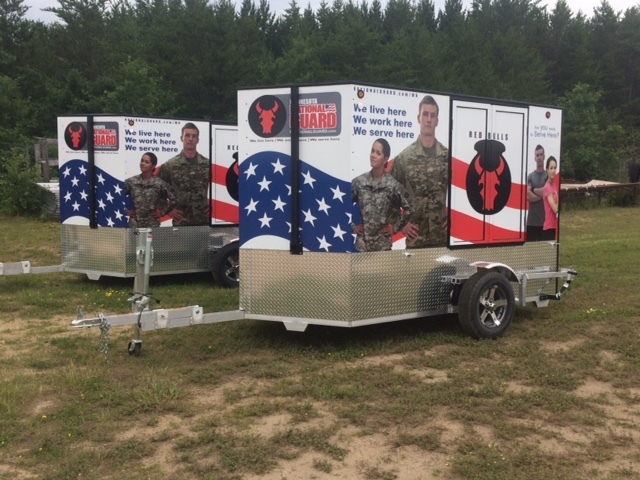 Bigger and Stronger, designed to haul heavier loads like UTV’s or two ATV’s. 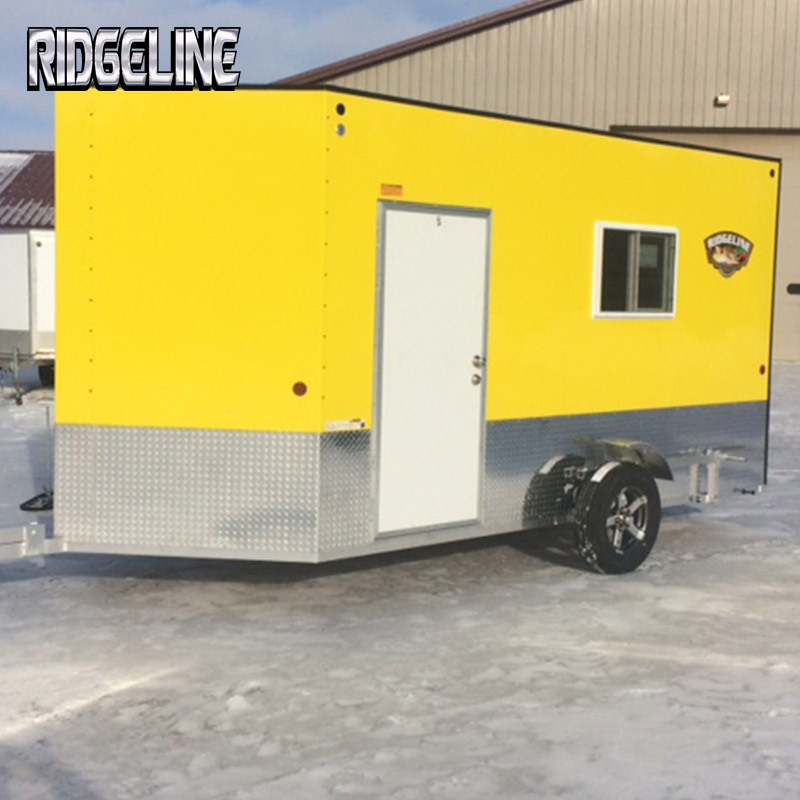 This large floor plan creates many options for use as a cargo/toy hauler or light weight camper, without getting too heavy to use for fishing! 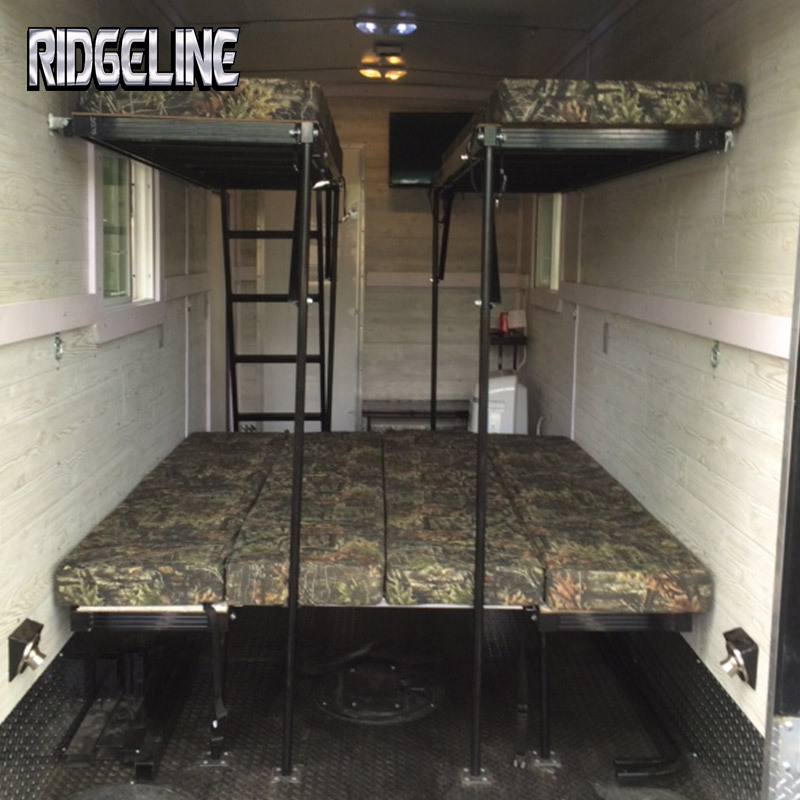 Perfect to finish off as a 3-4 person sleeper unit. 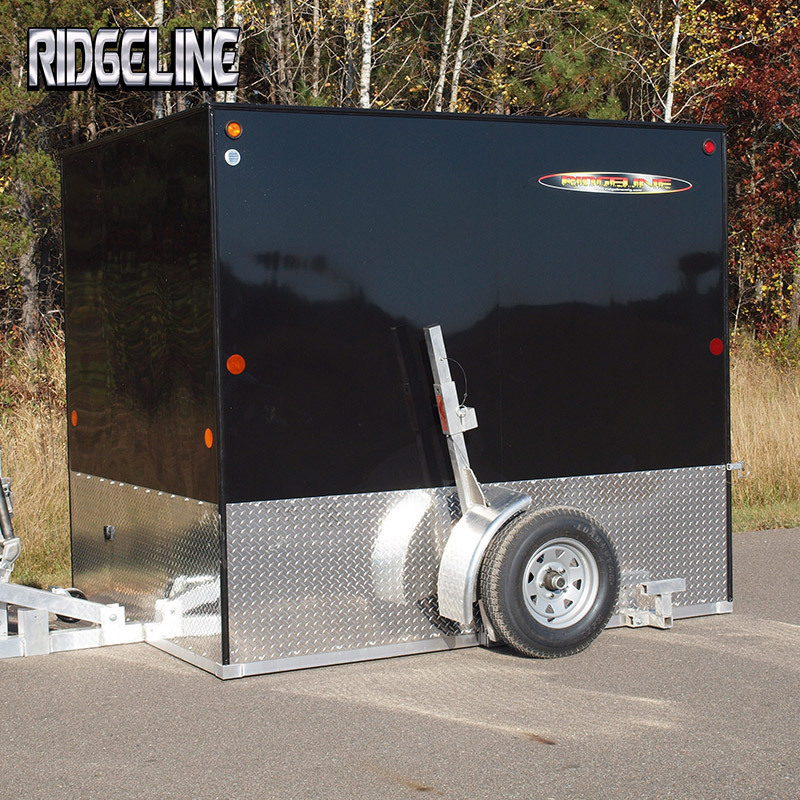 Upgrade to our 65”x77” ramp door on the rear to use as a toy hauler as well. 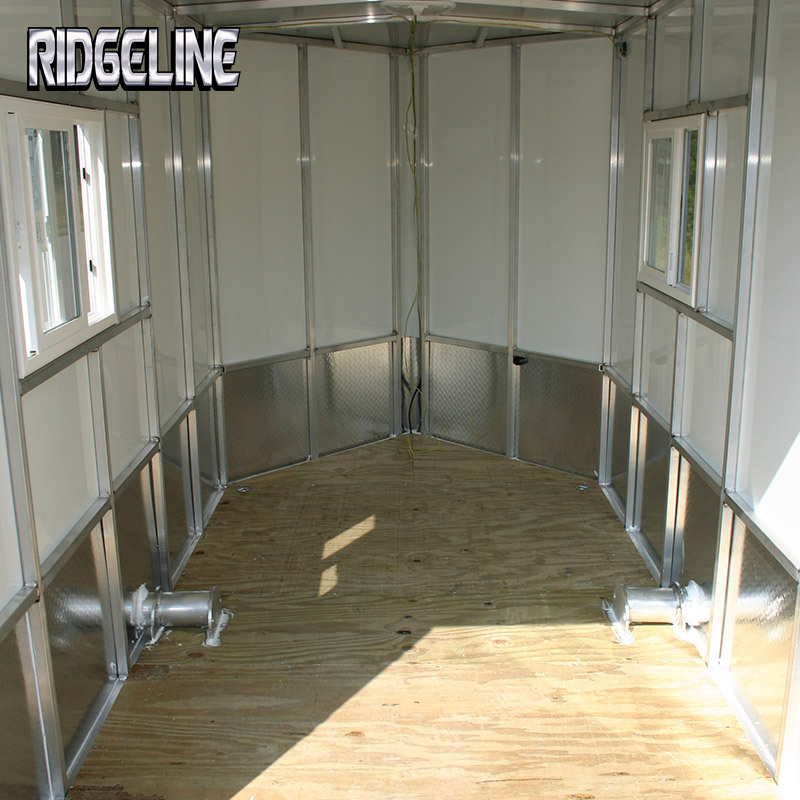 Ridgeline can build any size house you want for personal use or rental business needs. 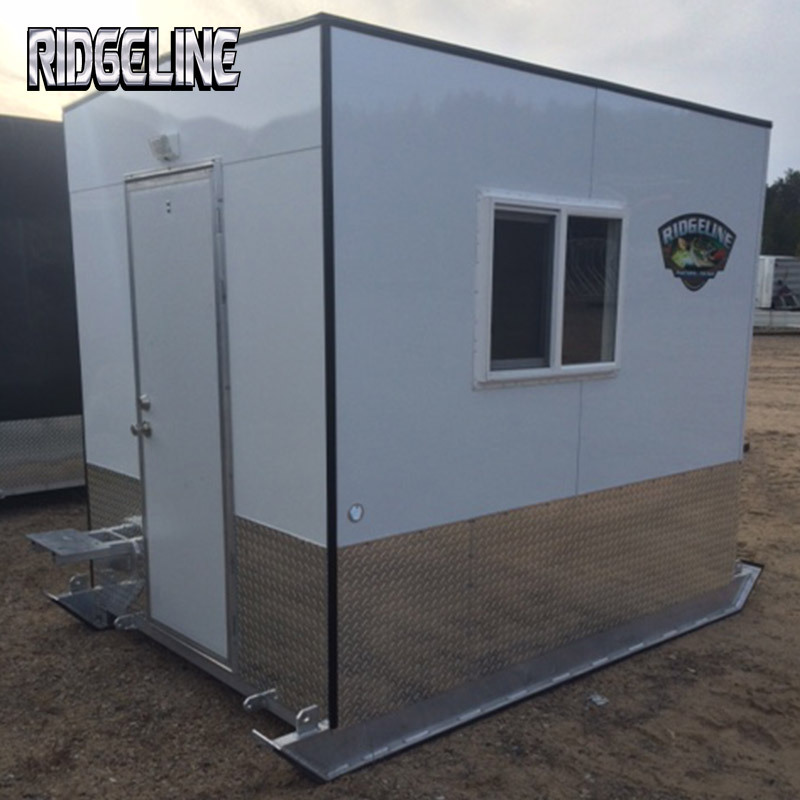 Give us a call to custom build your next skid house. • Truly Allows You to Travel Across an Un-Plowed Lake – Away From the Crowds to Your Favorite Spots. 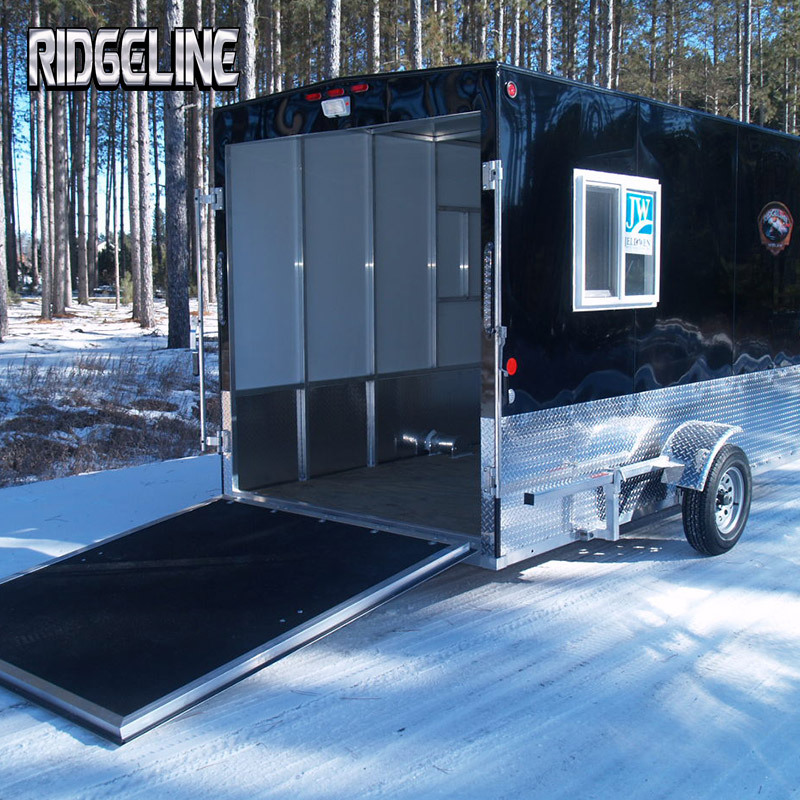 • Towable By an ATV or Snowmobile. • Fast Moves – No Tearing Down Canvas or Cranking Up Wheels. • Stay Warm – Small “Buddy” Type Heater is All You Need. • Stay Dry – No Feet or Gear on the Ice. • Beat The Wind – No Flapping Canvas To Drive You Crazy. 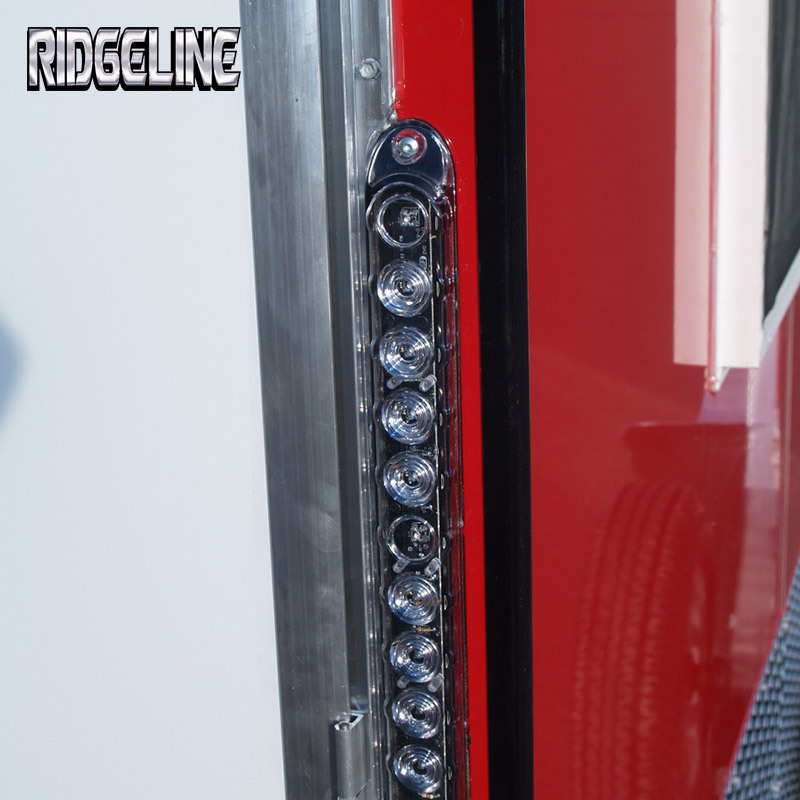 • Stay Organized – Easy to Customize to Store Poles and Other Fishing Gear. • Does Not Wear Out Quickly Like Canvas – Delivers Many Years of Use and Holds Resale Value. • Cheap to Heat – Save $100’s a Year in Propane Costs. • Much Less Expensive Vs. a Wheel House. • Center ski continues under house full length, providing valuable flotation and reinforcing the floor structure with the added frame member. 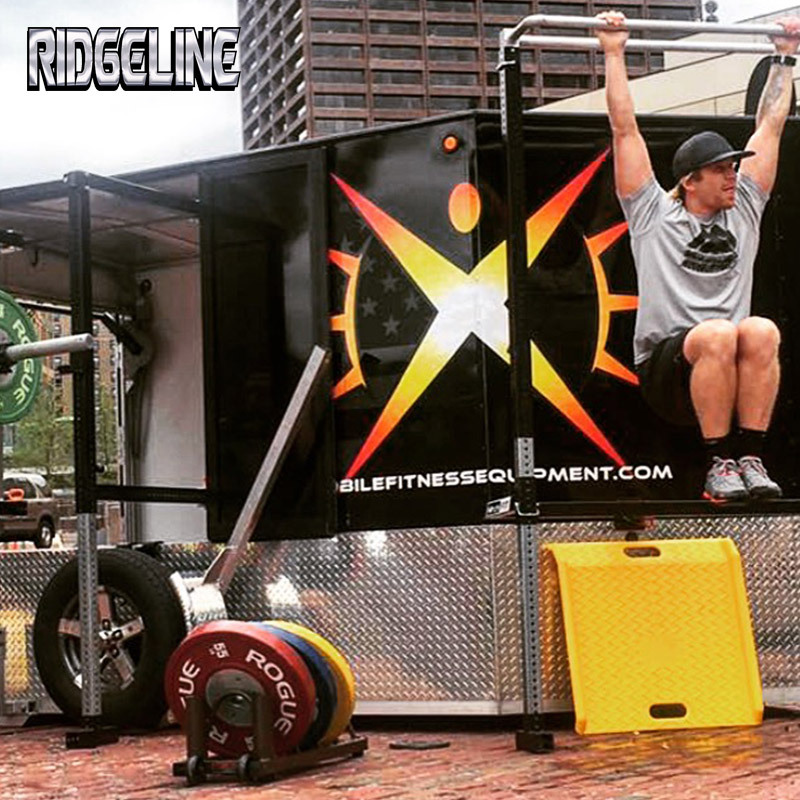 • 8’x10′ V Front weighs only 775 lbs. 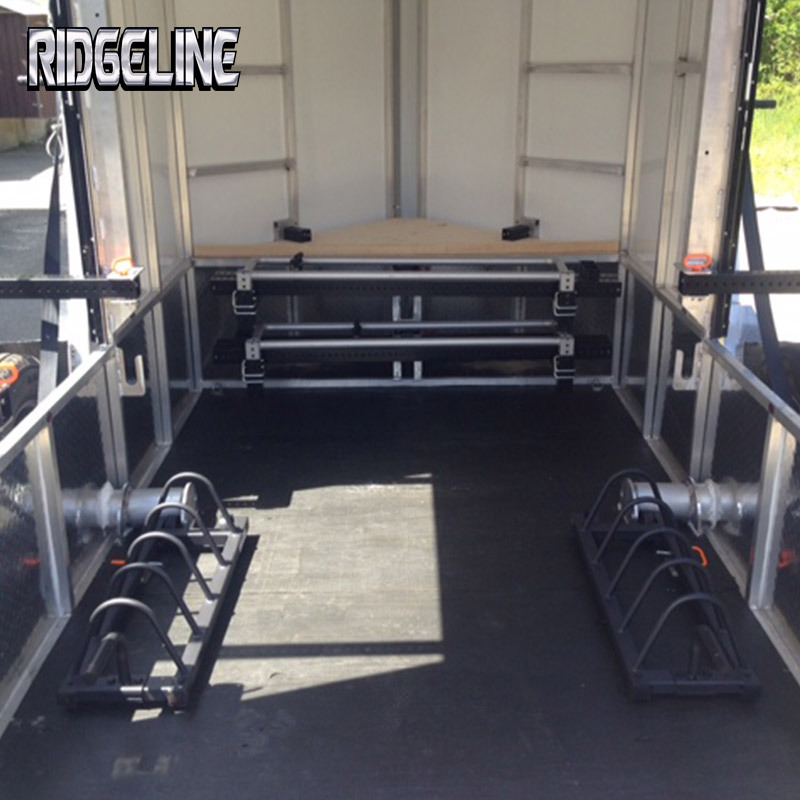 and 8’x12′ V weighs 850 lbs. 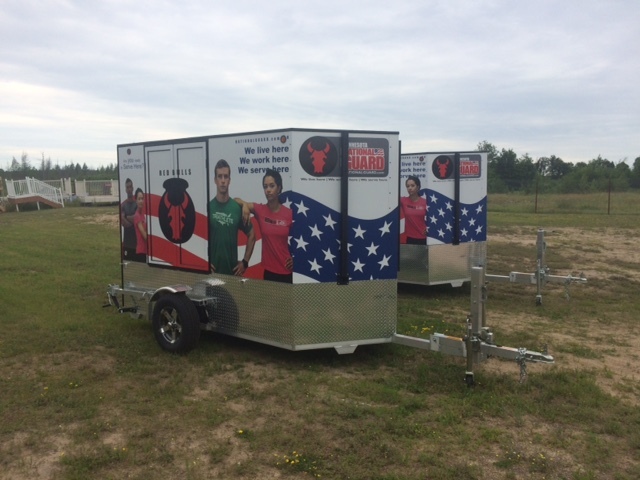 Strong Mobile Ice House! Easy to tow – Fun To Fish In – Impressive To See. Incredible Space! 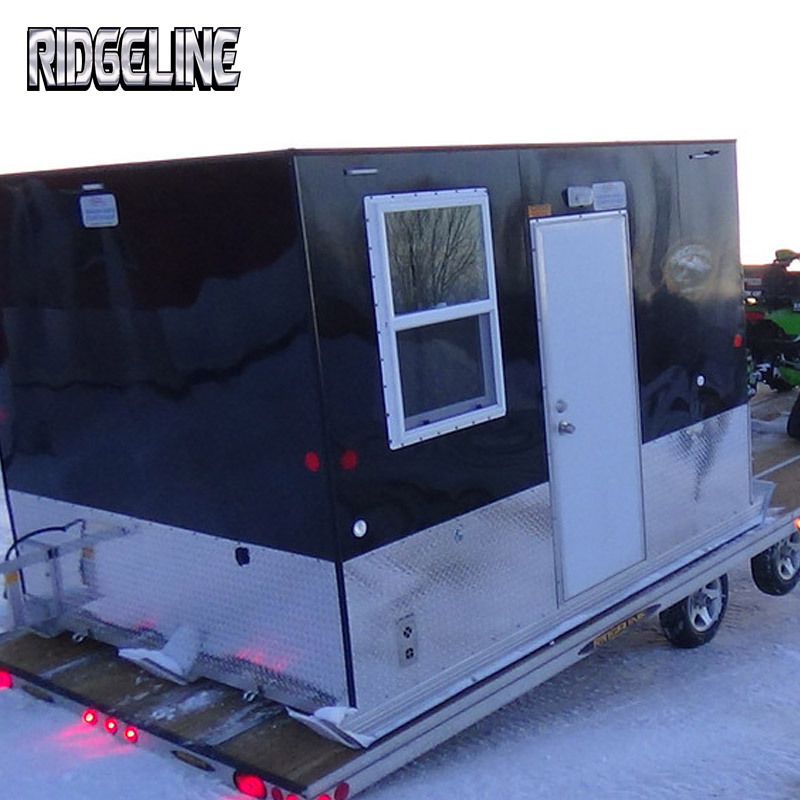 Best moved on snowmobile trailer. Great for sleepers and several people fishing. Why has high quality become synonymous with “over-built”? 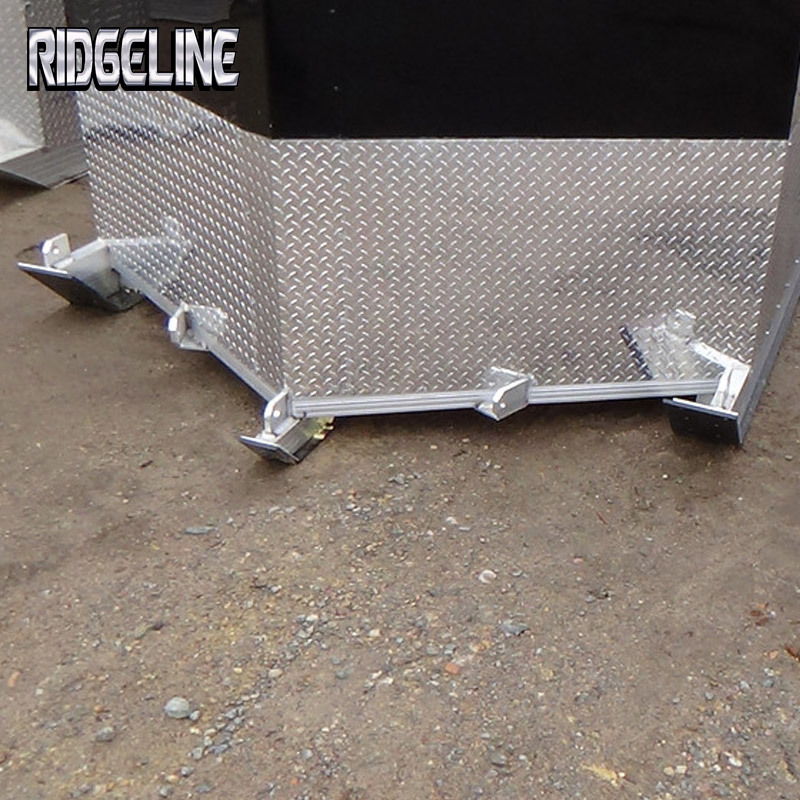 At Ridgeline Manufacturing we don’t believe in cutting corners. We’re busy bolstering builds and refining designs. We’ve always tried to bring the best product to the market for the dollar. We offer more standard – and you’ll notice the difference right away: All aluminum construction, torsion sub axle systems, arched roofs and a warranty to name a few. 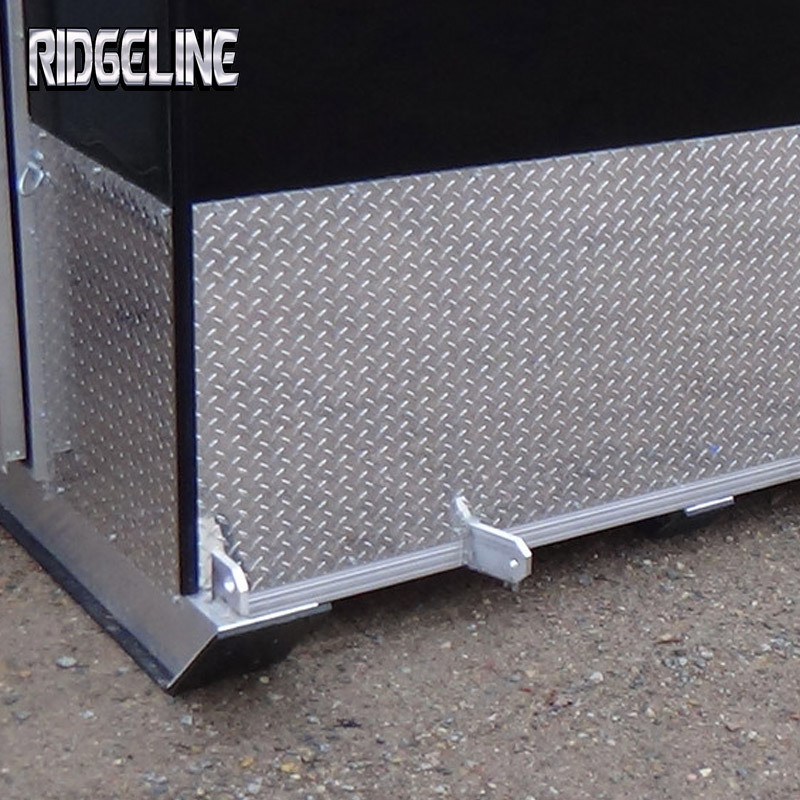 Ridgeline is quality and value – so let’s start building your next fish house. QUALITY WELDS. WE BACK IT UP. 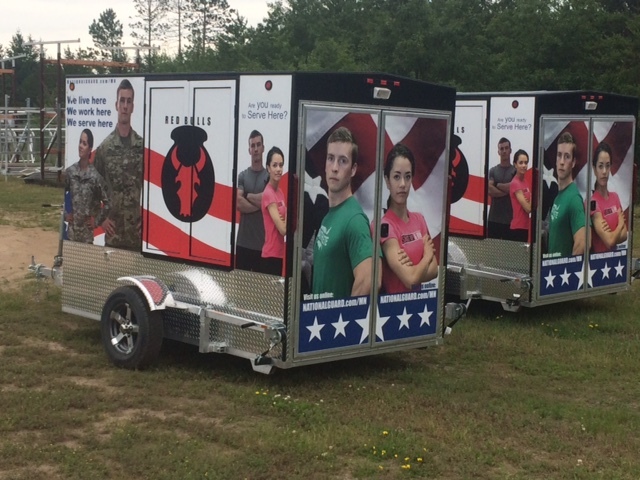 We strive to be the best and that is why we back up every trailer that we ship. 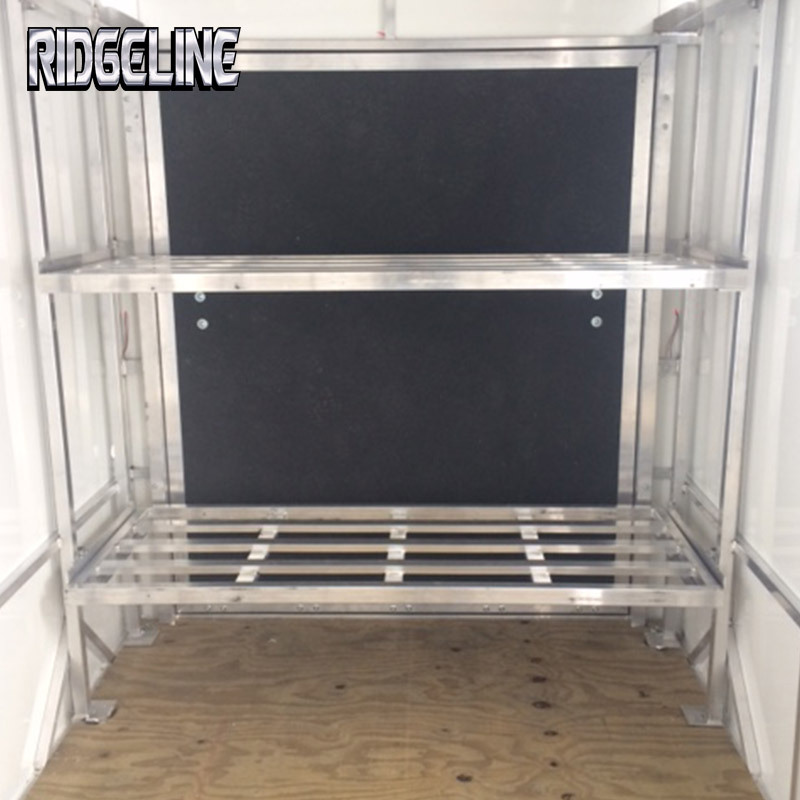 Large aluminum tubes, tempered extruded aluminum stock, and tested features are just a few reasons our trailers stand the test of time. 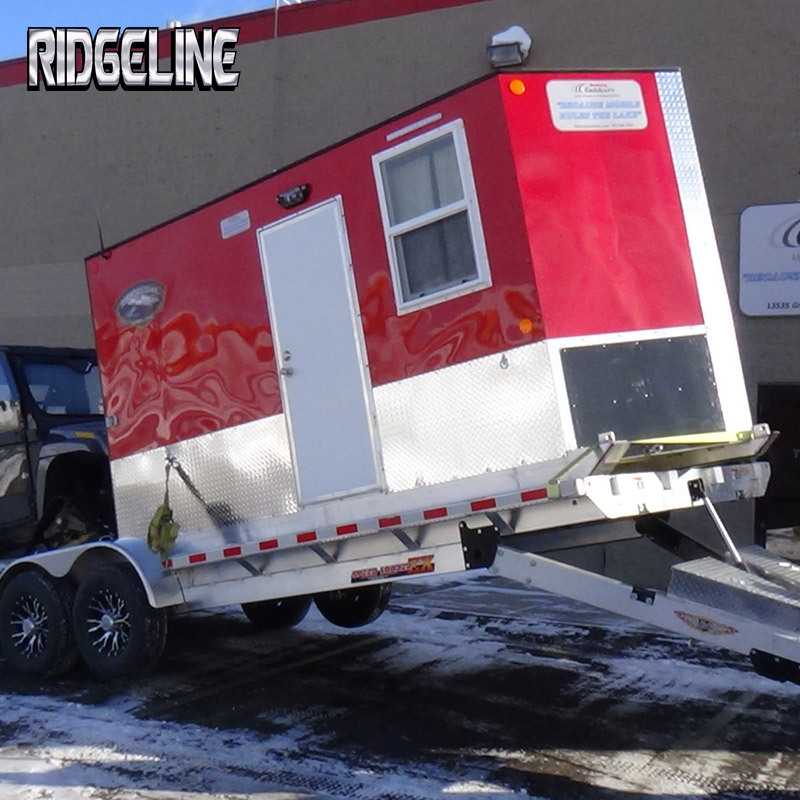 You can rest assured that this our trailers will provide years of great service – guaranteed. Questions, requests or just wanna talk about fishing? Shoot us a line – we’re ready to field your questions and to deliver your dream Fish House. 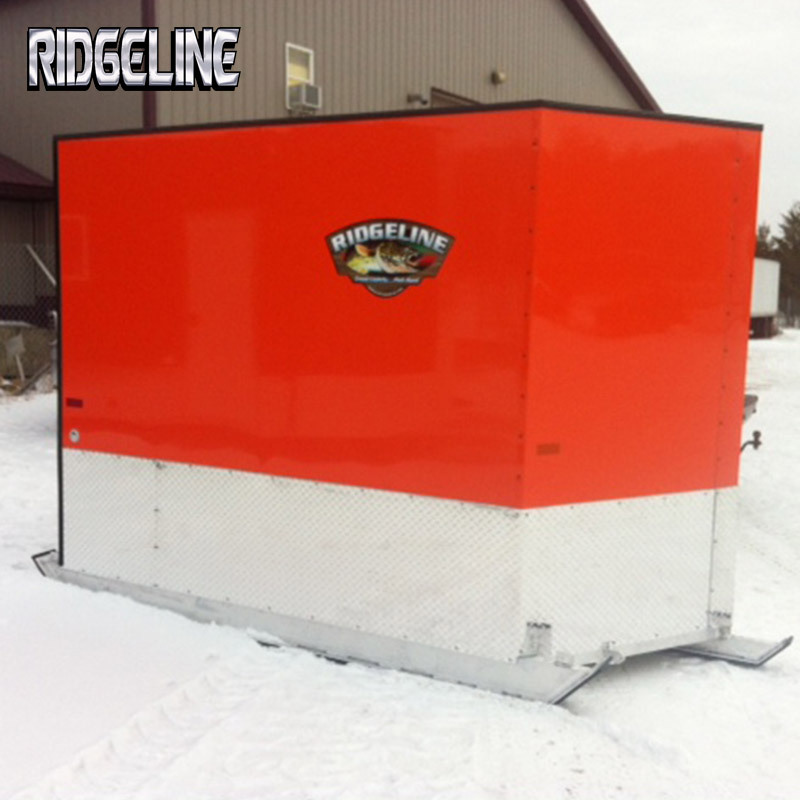 Ask for it by name, our Ridgeline Fish Houses are the best value you can get on and off the road.